We produce furniture to order. We make furniture from delivered designs, as well as perform our own visualizations based on customer preferences. We adjust our furniture to an apartment and demands of its residents. If you are interested in our offer, please contact us. We will arrange a meeting, discuss details basing on probes and then execute a project. We will perform the valuation on its basis and then you will make a decision on the implementation of an order. Nowadays, a kitchen is a very important place. It often becomes an element of an apartment’s décor, especially when we combine it with a living room. As a producer of kitchen furniture, we know that a kitchen design is a very important issue and should be carried out individually. 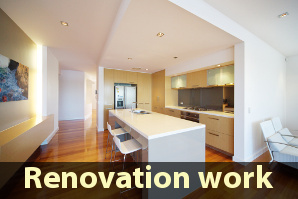 Remember that every kitchen to size is a perfect solution adjusted to your interior. Even going to an apartment, we should think about making a good impression on our guests. Hallway furniture is the first thing. This is what our eyes see first. It should be very thoughtful. 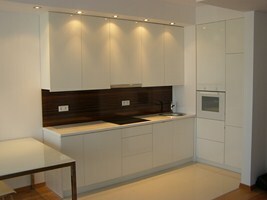 It must combine functionality and a sophisticated design fitting to the rest of an apartment. Here, we should also think and design furniture. Living room furniture is another issue - furniture which is the pride of our house or apartment. Living room furniture is primarily furniture which presents our style and is functional. It should be designed in a way that every item has its place. At the same time, all our guests and we ourselves should feel there nice and pleasant. The next room is a place where women spend a lot of time. We should feel nice and cozy in every bathroom. Adequate bathroom furniture will make our space practical and perfect to relax. A bathroom furniture design will allow us to create a harmonious whole. A wardrobe is our private space - no one but we would rather use it. Its inside should be designed in such a way as to use every inch of space the most, and at the same time provide us with an easy and transparent access to all items and clothing which you will find there. Wardrobe doors are the most important, as only they will be visible to everyone and can constitute a key component of our room’s décor. They can be large sliding doors and then we can hang a mirror on them, or any graphic element (e.g. a photo or an aluminum panel). It can be also a wardrobe with sliding doors painted in fashionable colors or stylish wooden doors. Increasingly, they are the only part of your living room’s décor. We can adjust them to the equipment that you have. We can create a private cinema in our house thanks to them and of course carefully selected speakers. These small pieces of furniture must fit the rest of components of an apartment’s style. Their size, color and general design should be designed depending on space and utility. A bedroom is one of the places where we spend almost half of our lives. We start furnishing our bedroom with choosing a bed and positioning it in the room. The most popular method is to place it in the center of a room, in the middle, with the headboard touching the wall. The bedroom should be designed in such a way to create a sense of space which fosters relaxation and regeneration - thus be sure to avoid the accumulation of furniture, equipment and accessories. They should be functional enough to accommodate all the necessary things in a bedroom (clothes, books, magazines, CDs) - and at the same time not to take too much space. Before the execution of a bedroom design, it is recommended to consider its functionality - what kind of actions we would like to perform there and whether the distribution of equipment will allow us to do so. At this point, we plan space, which we will be very useful in the future to make full use of a room in such a way and for such purposes, which were intended. You can achieve all the above by ordering furniture made to order. Remember that furniture to size will make every object have its place in your house and everything will constitute a harmonious whole. We develop a design for each order on the basis of consultations and measurements carried out during a first visit to a customer. The valuation of a service is performed on its basis. At the moment, such a design and a visit of our agent with probes and stencils of accessories are FREE. If you want us to produce furniture on the basis of a design which you already have, please send it by e-mail. We need of course a detailed deion to carry out a valuation.